Recipients of blood and blood components risk acquiring infections from foreign biological organisms, either pre-existing in the blood at the time of collection or transmitted to the blood product during manipulation. Medical personnel who are in contact with collected human blood or clinical samples also have a significant chance of being exposed to potentially lethal blood-borne or sample-borne biological organisms. Blood components today are obtained from blood donors and frequently involve pooled lots, where one or more of the donors may be harboring a viral, bacterial or other infection. Since the blood or blood components are required to provide physiological functions in a mammalian host, normally a human host, these functions must not be impaired by the decontamination treatment of the biological composition. In addition, the blood or blood components may not be modified in such a way as to make them immunogenic which could result in an adverse immune response. Finally, any treatment should not leave residues or products detrimental to the health of the host or such residues or products should be readily removable. U.S. Patent No. 4,327,086 describes the method for heat treating an aqueous solution containing human blood coagulation factor XIII. U.S. Patent No. 4,321,919 proposes extracorporeal treatment of human blood with 8-methoxypsoralen (8-MOP). Hyde and Hearst, Biochemistry (1978) 17:1251-1257, describe the binding of two psoralen derivatives to DNA and chromatin. Musajo et al., Experientia (1965) XXI, 22-24, describe photo-inactivation of DNA-containing viruses with photosensitizing furocoumarins. U.S. Patent Nos. 4,350,594, 4,348,283 and 4,350,156 describe filtration methods for selective removal of blood components based on molecular weight. U.S. Patent No. 4,329,986 describes extracorporeal treatment of blood with a chemotherapeutic agent which is subsequently removed by dialysis. The Julyl August 1982 issue of Genetic Engineering News proposed the use of psoralens to sterilize "clinical or commercial reagents or instruments." Hearst, Nucleic Acids Res. 1977, 4(5) 1339-47 describes the photoinactivation of animal RNA viruses treated with specific psoralen derivatives. EP-A2-0030358 Leukocyte Research, Inc., describes a method for treating blood to reduce the functioning lymphocyte population, the method involving irradiating blood which has been treated with a psoralen compound. EP-A2-0066886 Kronenberg, describes a method of inactivating target cells by treating the cells with psoralens and then irradiating them with long wavelength ultraviolet light. Some data showing substantial impairment of the biological function of certain enzyme proteins using furocoumarins are published in the scientific literature (see for example, Veronese, F. M. et al., Photochem. Photobiol. 34: 351 (1981); Veronese, F. M. et al., Photochem. Photobiol. 36: 25 (1982)). In the present invention methods and compositions are provided for decontamination of blood components, by permanently inactivating viruses capable of having pathological effect in a mammalian host. Particularly, psoralen compositions are employed for inactivating viral genomes capable of infectious replication in a mammalian host. Aqueous compositions such as blood components may be decontaminated by treatment with psoralen derivatives, and irradiation, preferably with long wavelength ultraviolet (UVA) light, whereby the physiological activities of the non-nucleic acid components are retained. 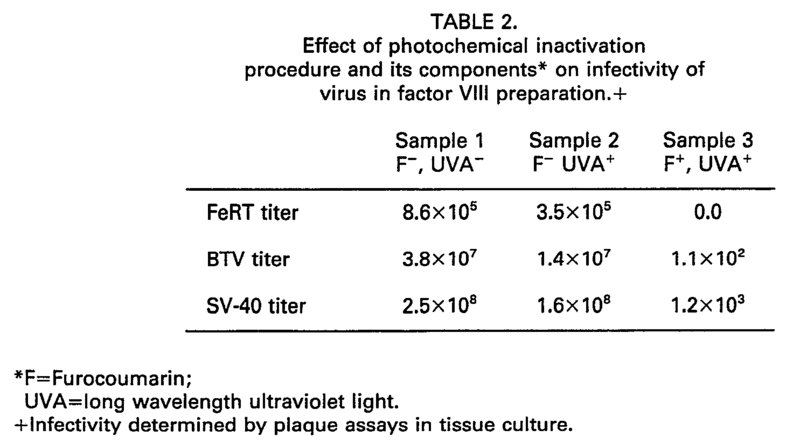 In decontaminating the blood component(s), an aqueous medium containing the blood component(s) is combined with an appropriate amount of the psoralen composition and irradiated with ultraviolet light under conditions where all of the virus is inactivated, while components other than virus retain their normal physiological activities. Various blood components may be employed. Red blood cells, blood clotting factors, platelets, plasma (fresh or fresh frozen plasma) and immunoglobulins are of interest. Particular blood components of interest include, plasma protein portion, antihemophilic factor (AHF, Factor VIII); Factor IX and Factor IX complex (Factors II, VII, IX and X); fibrinogens, Factor XIII, prothrombin and thrombin (Factor II and Ila); immunoglobulins (e.g. IgA, IgD, IgE, IgG and IgM and fragments thereof e.g. Fab, F(ab)2, Fc); hyperimmune globulins as used against tetanus and hepatitis B; cryoprecipitate; albumin; interferons; lymphokines, transfer factors; etc. Other biological compositions include vaccines, recombinant DNA produced proteins, oligopeptide ligands, etc. The protein concentration in the aqueous medium will generally range from about 1 pg/ml to 500 mg/mi, more usually from about 1 mg/ml to 100 mg/mi. The pH will normally be close to physiological pH (-7.4), generally in the range of about 6 to 9, more usually about 7. Other components may be present in the medium, such as salts, additives, buffers, stabilizers. These components will be conventional components, which will be added for specific functions. The psoralens will include psoralen and derivatives, where the substituents will be: alkyl, particularly of from 1 to 3 carbon atoms, e.g. methyl; alkoxy, particularly of from 1 to 3 carbon atoms, e.g. methoxy; and substituted alkyl, of 1 to 6, more usually 1 to 3 carbon atoms having from 1 to 2 heteroatoms, which will be oxy, particularly hydroxy or alkoxy of from 1 to 3 carbon atoms, e.g. hydroxymethyl and methoxymethyl, or amino, including mono- and dialkyl amino having a total of from 1 to 6 carbon atoms, e.g. aminomethyl. There will be from 1 to 5, usually 2 to 4 substituents, which will normally be at the 4, 5, 8, 4' and 5' positions, particularly at the 4'-position. Illustrative compounds include 5-methoxypsoralen, 8-methoxypsoralen (8-MOP), 4, 5',8-trimethylpsoralen (TMP), 4'-hydroxymethyl-4,5'8-trimethylpsoralen (HMT), 4'-aminomethyl-4,5',8-trimethylpsoralen (AMT), 4-methylpsoralen, 4,4'-dimethylpsoralen, 4,5'-dimethylpsoralen, 4',8-dimethylpsoralen, and 4'-methoxymethyl-4,5',8-trimethylpsoralen. The subject psoralens are active with a wide variety of viruses and other polynucleotides, DNA or RNA, whether single stranded or double stranded. Illustrative viruses include: adenovirus, arenavirus, bacteriophage, bunyavirus, herpesvirus, orhtomyxovirus, papovavirus, paramyxovirus, picornavirus, poxvirus, reovirus, retrovirus, rhabdovirus, and togavirus. Additional pathogenic microorganisms include bacteria, chlamydia, mycoplasma, protozoa, rickettsia and other unicellular microorganisms. They may also be effective in inactivating Hepatitis B and Non-A Non-B Hepatitis viruses. This inactivation method may also be used against uncharacterized infectious agents which may contain nucleic acid (such as the agent which causes Acquired Immune Deficiency Syndrome). In addition to the furocoumarins, additives may be included which scavenge for singlet oxygen or other highly reactive oxygen containing species. Such additives include ascorbate, glutathione, sodium thionite, etc. In some instances these additives may have adverse effects, so that in each instance, their use will be determined empirically. Where such additives-are present, they will be present in amounts ranging from about 20 µg to 20 mg per ml. The psoralens may be used individually or in combination, preferably in combination. Each of the furocoumarins may be present in amounts ranging from 0.01 µg/ml to 1 mglml, preferably from 0.5 pg/ml to 100 pg/ml, there not being less than 1 µg/ml nor more than 1 mg/ml of psoralens. For RNA, the preferred psoralens are AMT and HMT. For DNA, the preferred psoralens is TMP. For mixtures of DNA- and RNA- containing polynucleotides, or for inactivation of infectious agents or possibly infectious agents of unknown or uncertain nucleic acid classification, or for protection against infections of unknown etiology, preferably TMP and AMT are used in combination. In carrying out the invention, the psoralens may be added to the biological composition by any convenient means in a manner substantially assuring the uniform distribution in the composition. The composition may then be irradiated under conditions ensuring that the entire composition is exposed to sufficient irradiation, so that the furocoumarins may react with any polynucleotide present to inactivate the polynucleotide. Depending upon the nature of the medium, particularly its opacity, as in the case of blood, the depth of the solution subject to irradiation will vary widely. Usually, the depth will be not less than 0.025 millimeter, but may be a centimeter or more. With whole blood, the depth will generally range from 0.025 millimeter to 2.5 millimeters. The light which is employed will generally have a wavelength in the range of 300 nm to 400 nm. The intensity will generally range from 0.1 mW/cm2 to 5 W/cm2. In order to prevent denaturation, the temperature should be maintained below about 60°C, preferably below about 40°C, usually from about -10°C to 30°C. The medium being irradiated may be irradiated while still, stirred or circulated, and may either be continuously irradiated or be subject to alternating periods of irradiation and non-irradiation. The circulation may be in a closed loop system or it may be in a single pass system ensuring that all of the sample has been exposed to irradiation. The total time for irradiation will vary depending upon the nature of the sample, the furocoumarin derivative used, the intensity and spectral output of the light source and the nature of the polynucleotides which may be present. Usually, the time will be at least 1 min. and not more than about 6 hrs., more usually from about 15 mins. to about 2 hrs. When circulating the solution, the rate of flow will generally be in the range of about 0.1 ml/min to 50 litersl min. It may be desirable to remove the unexpended psoralen and/or its photobreakdown products from the irradiation mixture. This can be readily accomplished by dialysis across an appropriately sized membrane or through an appropriately sized hollow fiber system after completion of the irradiation. It may be desirable in certain applications to remove bound or unbound furocoumarins using antibodies, including monoclonal antibodies, either in solution or attached to a substrate. The blood aliquot that received HMT only and no irradiation gave a titer of 5.3x 106PFU/ml. The aliquot that received HMT and five minutes of irradiation exhibited a titer of 4.5x105PFU/ml. In the aliquot that received psoralen plus one hour of irradiation there was no detectable live virus remaining. The sensitivity of this assay should have permitted detection of residual virus at titers ≧1.0x101PFU/ml. A blood sample which had received HMT and one hour of irradiation also showed no apparent damage to the red blood cells as judged by phase contrast microscope analysis and by absence of visible hemolysis. These data therefore demonstrate that high virus titers present in whole blood can be inactivated by psoralen plus light treatment which leaves the red cell component of the blood intact. (2) In the second experiment Blue Tongue Virus (Serotype 11), a member of the reovirus family, and Feline Rhinotracheitis Virus, and Simian Virus 40 were added to a solution of Profilate® (a commercial preparation of human clotting factor VIII produced by Alpha Therapeutics). The lyophilized preparation of Profilate® (180 units) was dissolved in 10 ml of sterile water included with the commercial preparation. This solution was further diluted with barbital buffer (11.75 g sodium barbital and 14.67 g NaCI dissolved in 2 liters of de-ionized water and filtered through a 0.22 micron filter) to a final concentration of 5 units per milliliter. One portion (2 ml) was set aside at room temperature in the dark. This was sample #1. A second 2 ml portion was pumped through the apparatus described below for 1 hour with irradiation. This was sample #2. Through addition of appropriate amounts of reagents a third 2 ml portion was adjusted to contain 10 pg/ml AMT and 10 pg/ml HMT and was also irradiated for 1 hour. This was sample #3. The fourth 2 ml portion was adjusted to 10 µg/ml AMT, 10 pg/ml HMT, and 10 mM sodium ascorbate and was also irradiated for 1 hour. This was sample #4. All the samples were kept at 20°C throughout the manipulations. The total elapsed time from dissolving of the lyophilized preparation to the completion of the clotting factor Vlll assays was 6 and one-half hours. The clotting factor Vlll assays were performed at a variety of dilutions (ranging from 1:5 to 1:100) for each sample and were compared with the activity in normal human serum and with pooled normal human serum. The results are summarized in Table 1. The sample that was subjected to the psoralen inactivation protocol (sample #3) retained 84% of the factor VIII activity that was present in the control sample (#1). 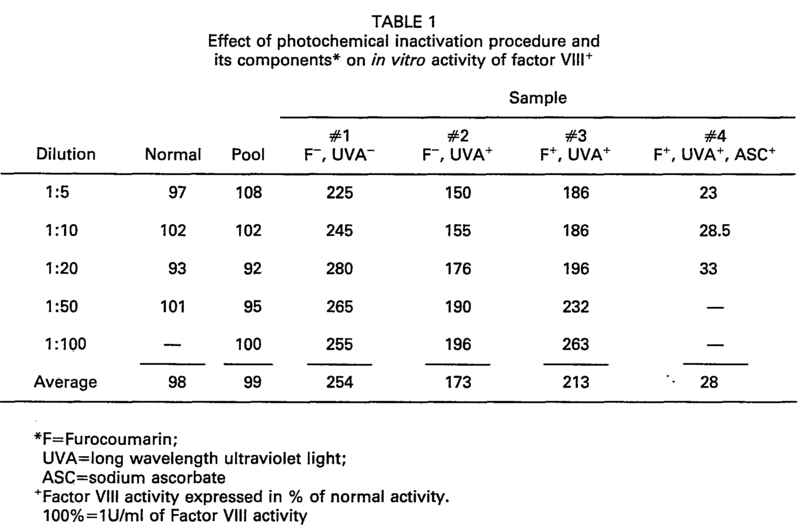 This was higher than the percent activity retained by the sample that was only irradiated (68% retained for sample #2) and indicates that the psoralen photochemistry has little or no effect on the activity of factor VIII. Surprisingly, the presence of sodium ascorbate (a scavenger of singlet oxygen which has been shown to protect enzymes from inactivation in the presence of psoralens and light) during the irradiation causes the factor VIII activity to drop to 11 % of the level in the control sample. Samples otherwise identical to samples 1, 2, and 3 above were seeded with 2x106PFU/ml of Feline Rhinotracheitis Virus (FeRT), 1 x107PFU/ml of Blue Tongue Virus (BTV), and 4x108PFU/ml of Simian Virus 40 (SV-40). Table 2 shows the results of the plaque assays on those samples. In the case of FeRT the number of detectable virus particles was reduced by more than five orders of magnitude to beneath the limit of detection in the plaque assay. The BTV infectivity was reduced by about five orders of magnitude to 110 PFU/ml. The SV40 infectivity was reduced to a titer of 1.2x103. Thus, it is shown that multiple, widely distinct types of virus can be simultaneously inactivated by at least five orders of magnitude in the presence of factor VIII, using the simple, convenient, brief process described above, with retention of at least 84% of factor VIII activity. Based on the above observations, it is predictable that by extending, repeating or modifying the treatment, the probability of an infectious virus particle remaining can be reduced to an arbitrarily low value. In this manner suitable safety margins can be achieved for any of the cited applications. It is evident from the above results, and in accordance with the subject invention, that polynucleotides in biochemical compositions can be inactivated to provide a safe composition for administration to a mammalian host. The proteins present in the composition retain their physiological activity, so that they can fulfill their physiological function in a mammalian host. The method is simple, rapid, and can be expanded to treat large samples. The small amount of chemical reagent required will not generally be harmful to the host. (b) irradiating said psoralen-treated blood component with long wavelength ultraviolet light under operating conditions which maintain the concentration of reactive oxygen species at levels which do not substantially impair the physiologically active blood component and wherein the amount of the psoralen and the duration of the irradiation is sufficient to inactivate substantially all contaminating viruses present. 2. A method according to Claim 1, wherein at least two psoralen compounds are present. 3. A method according to Claim 1, wherein said blood component is a clotting factor. 4. A method according to any of Claims 1 or 2 wherein any unreacted psoralen(s) or photobreakdown products thereof are selectively removed by ultrafiltration or dialysis. 5. A method according to Claims 1 and 2 wherein psoralen(s) or blood components which have reacted with the psoralen(s) are selectively removed by antibodies to those modified components. (b) passing the psoralen-treated blood component through a light beam with a wavelength in the range of 300 nm to 400 nm at an intensity of 0.1 mW/cm2 to 5 Mw/cm2 at a depth of at least 0.025 mm for a total irradiation time of from 5 min to 12 hrs, the irradiation being conducted under operating conditions which maintain the concentration of reactive oxygen species at levels which do not substantially impair the physiological activity of the treated blood component. 7. A method according to Claim 6, wherein two psoralens are in said medium, said two psoralens being 4'-hydroxymethyl-4,5',8-trimethylpsoralen and 4'-aminomethyl-4,5',8-trimethylpsoralen. 8. A method according to Claim 6, wherein said blood component is a clotting factor. 9. A method according to Claim 1 or Claim 2 wherein Hepatitis A, Hepatitis B and Non-A Non-B Hepatitis viruses are inactivated in the blood components. 10. A method according to Claim 1 or Claim 2 wherein the viral agent which causes Acquired Immune Deficiency Syndrome (AIDS) is inactivated in the blood components. 11. A method according to Claim 1 wherein the level of reactive oxygen containing species is reduced. 12. A method according to Claim 11 wherein the level of reactive oxygen containing species is reduced by the addition of an oxygen scavenger. AT84302845T AT59145T (en) 1983-05-02 1984-04-27 Photochemical entkeimungsbehandlung of full blood or blood constituents. NL2000281C2 (en) 2005-11-02 2007-08-07 Pfizer Prod Inc Solid pharmaceutical compositions containing pregabalin. Owner name: DIAMOND SCIENTIFIC CO.